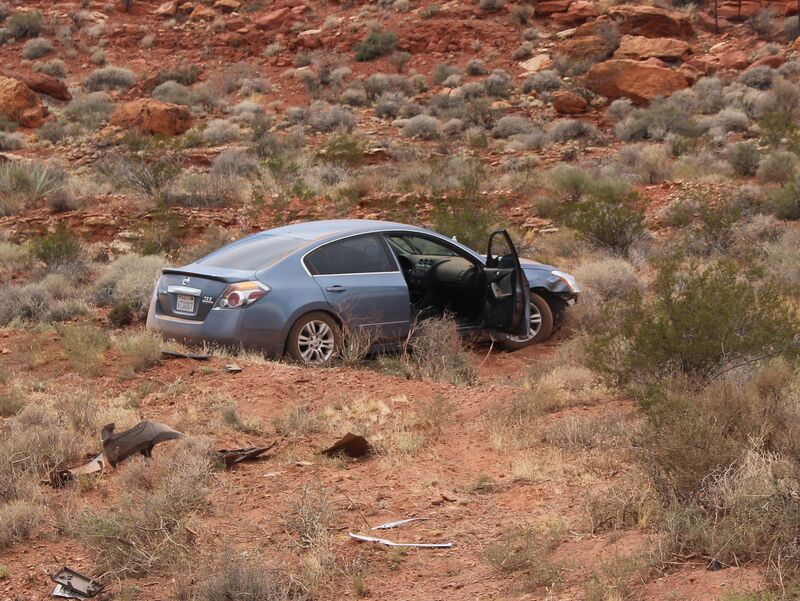 WASHINGTON COUNTY — A car ended up at the top of a hill from the impact of a two-vehicle collision Monday on Interstate 15 which thrust both vehicles off the right side of the road. At approximately 3:13 p.m., a California driver of a Nissan car was in the left lane of southbound I-15 near milepost 16 while the St. George driver of a Mitsubishi SUV was merging onto the Interstate from the state Route 9 on-ramp, Utah Highway Patrol Sgt. Larry Mower said. The driver of the Mitsubishi told troopers he didn’t see the Nissan until he felt contact with his vehicle, Mower said. The resulting collision was not unlike the PIT maneuver officers perform on vehicles that won’t stop for them. The collision sent both cars skidding onto the right shoulder of the Interstate. The Mitsubishi came to rest at the side of the road, but the Nissan continued up a dirt hill and came to rest about 50 feet off the side of the road. The driver of the Nissan was taken by ambulance to Dixie Regional Medical Center in St. George to be checked out. The driver of the Mitsubishi did not report any injuries as a result of the crash, Mower said, adding that both drivers had been wearing their seat belts. The driver of the Mitsubishi was issued a citation for improper lane change. Not paying attention creates situations like this and thankfully no one was hurt. but this could of been so much worse depending on the landscape. at least both parties involved will be home with their loved ones. .Praise the Lord !